Boro pushed aside Birmingham City with another impressive victory at the Riverside to stay top of the league. 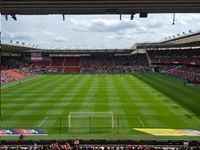 The 1-0 scoreline does not to justice to Boro's performance and only the width of the woodwork saved the visitors from a more emphatic defeat. Boro's former Brum keeper Darren Randolph did have to work hard to keep his clean sheet at times but Boro were dominant and continue to steam onwards and upwards. Let's keep it going. The lack of success in the transfer window seemed to be the only topic of conversation pre match. Talk fuelled by Tony Pulis frank admissions that it leaves us well short on depth and quality for a promotion push. But the boss appealed to us to get behind the present players and with adventurous attacking victorious football like this everyone is enjoying themselves at present. I was joined by visitors from Norway and Canada yesterday and they were purring with delight at the way Tony Pulis Boro was performing. It was a more competitive first half than against Sheff United on Tuesday night. There were chances aplenty at both ends before the all important break through came. No one needed a goal more than Britt Assombalonga and for all his selfless hard work as a lone striker no one deserved it more. When the ball came through to him in the box, he shuffled feet before arcing a beautiful shot beyond the Blues keeper and into the far corner of the net. Glorious. The wonderfully weighted pass to Britt came from Jonny Howson, just as on Tuesday night it was an outstanding performance from the former Norwich man. He has started the new season like a train. A real plus in a creative midfield mould alongside the great promise displayed again by young Lewis Wing. Britt could have bagged a second soon after following a quite wonderful feint and flick from Braithwaite. The no.9 beat the keeper again but this time struck the post. Braithwaite's flick was World Cup class. We really need to keep him at this club and out of the European transfer window shopping. In between these Britt strikes Stewart Downing was so unlucky when his free kick clipped the inside of the post and rebounded out and not in. Boro pushed for the second again at the start of the second period. Birmingham were all at sea from a Ryan Shotton long throw that struck a bar and bounced down but away from Boro forwards. Howson almost grabbed the goal his performance deserved put an amazing goal line headed clearance by Morrison denied him. The ball broke back into the box and Howson headed across but agonisingly just beyond the reach of Britt. After all these near misses you had to fear that Brum would nick an undeserved equaliser at the death. Yet their hopes were really hit when Craig Gardner saw red for a reckless challenge on Howson in the middle of the park. It was unfortunate for Harry Chapman as well as Birmingham as he was about to come on to join Tavernier and Fletcher as sub before the away side went down to ten men. A rethink led to Paddy McNair being brought on to box it up. Boro held on through the 4 minutes added time to make it 2 home wins and an away draw at Millwall. We may have failed in the transfer window but Tony Pulis side continue to impress. Even without the three star players, Bamford, Gibson and Traore the football is good to watch. It is great to see youngsters Fry, Wing and Tavernier getting opportunities and impressing. Spread the word and let the season roll on.